“What’s for dinner?” This age old question may often be answered by take out, fast food, leftovers, or whatever you have stashed in the refrigerator. What if there was a better way. What if you only had to ask this question once a week? Meal planning is a great life skill to cultivate to help resolve the mystery surrounding meal times. For many people planning is a natural tendency, for others it may take a little more work to cultivate. 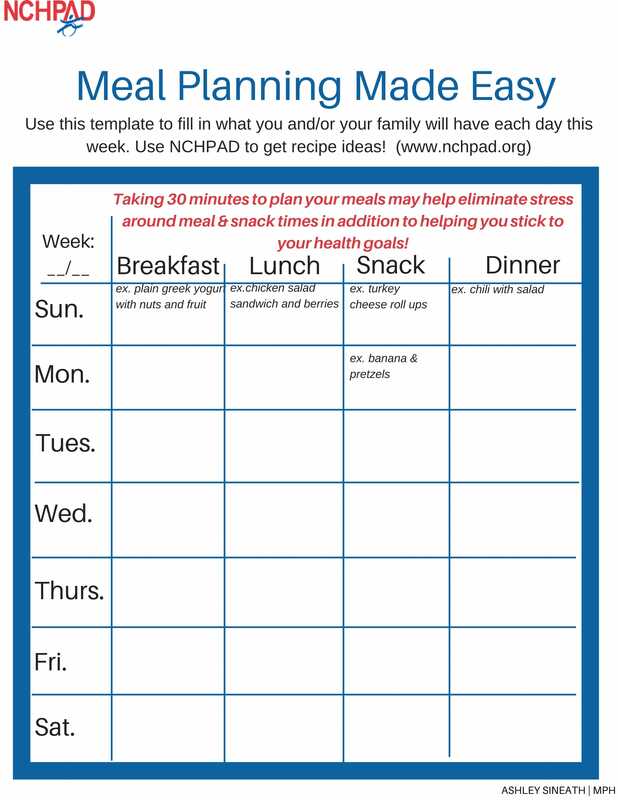 Wherever you fall across this spectrum, know that with a little practice, it is possible to incorporate meal planning into your weekly routine. In fact, by setting aside 30 minutes or more once a week to think about the days ahead, you can help eliminate meal time stress, make grocery shopping easier, and you may be more likely to adhere to your health goals whatever those may be. After all, you’ll be less likely to call for pizza delivery if you already planned and purchased the ingredients for a homemade meal. 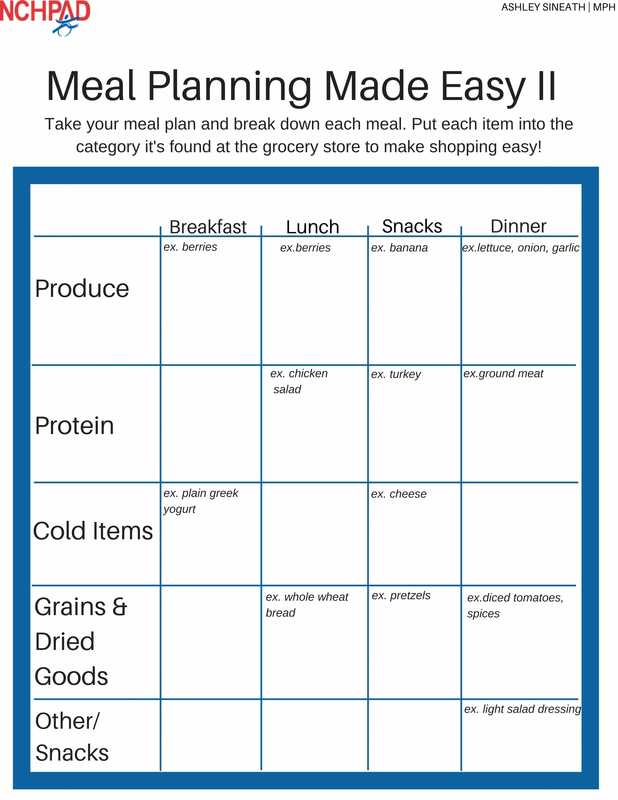 See the printable meal planner for a sample tool to try out. You can also create your own tool. All you need are the days of the week, and an outline of what you’ll eat on each day. You can break each day out into categories such as Breakfast, Lunch, Snack, and Dinner. If you feel up to it, you can also take it one step further to make your grocery shopping easier. Once you have your meals planned for the week, go back and make a list of all the ingredients you’ll need to prepare those meals. If possible, try making a few meals with similar ingredients to save money. For example, you could buy a pack of whole grain wraps and use them for breakfast wraps and lunch quesadillas. Another bonus of meal planning is saving more time and money. By eliminating excess trips to the store you may be more likely to spend less money as well as less time in the car throughout the week. If you think you’re ready to give meal planning a shot, just know it may take a few weeks to get the hang of it. Be patient, and figure out what system works best for you!